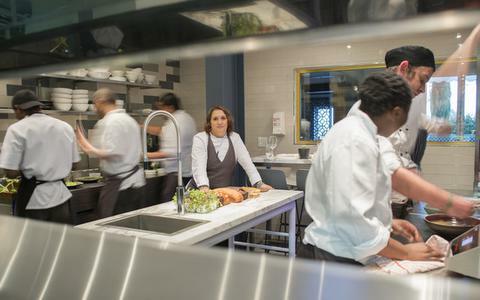 At a chef’s table, instead of sitting in a stylish restaurant with décor and views, people pay good money to join a small group dining, surrounded by working chefs inside a frenetic kitchen in full service. It’s usually a windowless, functional space with gaudy fluorescent lighting in the bowels of a building. The ‘kitchen table’ experience at Makaron restaurant is a stylish deviation. We’re the only two diners in the cold kitchen section, a window behind our subtly lit marble table offering a peep into the adjacent restaurant. 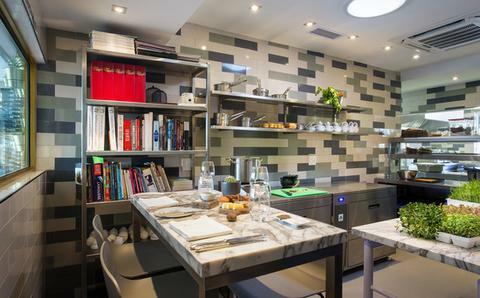 There are cookbooks to page through and metro tiles in multiple grey tones liven the walls. Sommelier Esmé Groenewald introduces the liquid entertainment. She’s chatty about all sorts, but her pet subject is undiscovered wine labels such as Chenin-blend Sijnn White. We enjoy impressive food moments, such as the ancient grains starter, where quinoa and couscous combine in a heart shape with tiny amaranth seeds (Wikipedia claims amaranth was a staple food of the Aztecs). Raw carrots and pea shoots resemble a tiny floral arrangement, with the silkiest pool of cream-laced cauliflower soup poured inside. Five courses arrive at a steady pace, but it feels more dinner party than restaurant. Although kitchen staff probably do notice whether you’re emptying every plate, there’s no sense of being observed. A seared tuna dish is marinated in red miso, and then combined with slivers of raw, bitter radish. There’s smoked tofu and textured crunch from crumbled Asian dragon crackers, savoury seeds and chillies. Thelema Riesling reigns in the dish with panache. There is sudden kitchen tension and lowered voices. A vegan table of four has arrived at Makaron without a reservation. Knocking together restaurant-worthy dishes without eggs, cream or butter is no easy task. There’s visible relief 10 minutes later: the table ordered only two courses. Makaron’s kitchen table has quirky touches too. Completing the meal, a vintage Guerlain make-up box is filled with crushed ice and homemade ice-cream wafer sandwiches. Bored with macarons and petit fours, the team takes turns nominating ice-cream flavours (they’ve made bacon to carrot cake). Our batch includes melon, biscotti and apple, but the ginger beer ice-cream wafer steals the show. A junior chef snaps two Polaroids. One is stuck on the kitchen pillar. We’re given the other as a memento of a diverting evening. MAKARON RESTAURANT, Majeka House, Houtkapper Street, Stellenbosch. Tel 021-880-1512 or Majeka. Kitchen Table dinners are R590 per person for five courses, or R900 inclusive of wine. This appeared in The Times on 5 November 2014.